Lethal is good. So is deadly. A little bit of Irish slang. Rapid, massive and savage are also all very good, as are dingin’, crackin’ and the dog’s bollix but cat and manky are pretty bad. Grand is the gold standard for good though sometimes it’s only barely acceptable. A cute hoor is someone of whom to be wide of but a sound man is yer only man while a tool and a chancer are definitely not reliable chaps. Langer takes practice and time spent gallavantin’ in The People Republic Of Cork to use properly but you can get langers or polluted in the pub while you are doing that and next morning you will probably be thrun down, as is likely to happen me at this weekend’s Irish Channel Party. I will, ya is the Irish double-positive refusal which the Oxford English Dictionary doesn’t think exists, as I will in me hole is also not a polite way of saying no. If you are just after your dinner, you are probably not hungry, especially if you are a back arse of beyond Tipperary stonethrowin’ bogger like Your’s Truly and have had a hape of hang sandwedges. Craic is the best drug in the world and can be harvested directly from Irish people who’ve had a few scoops. The craic is ninety, but the ride is a pound. 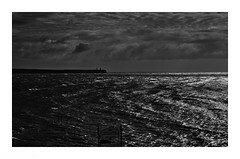 The sea around Ireland gets a bit nippy in the winter and has been known to be a bit lumpy in Force Six winds when you might get a figary to go for a swim especially is there is aer a sign of one of your friends going with you though other more sensible people will think you are not the full shillin’ even though a good sea swim is hard to bate. I’ve been doin’ a line with the future Mrs. Loneswimmer for a while now, she is actually one of the aul enemy but a class bird nonetheless. I’ll probably get a clatter for that. Stall the ball. I’m a bit of a hames myself, like. Now we’re suckin’ diesel. You can chalk that down. Lethal, Deadly, Rapid, Massive, Savage Dingin’, Crackin’ ,The dog’s bollix all mean good but lethal can also mean dangerous. Cat means bad while manky is smelly and dirty. Grand means good though sometimes it only means alright. A cute hoor is sneaky, opportunistic or untrustworthy. Often politicians. Being wide of means being careful of. A sound man is yer only man is a good reliable chap. A tool and a chancer are respectively an idiot and an opportunist . Langer could have multiple paragraphs written about it, but in the singular means male genitalia and a straightforward insult. You’d have to know a person well to be able to use it in a non-insulting manner. Galavantin’ means roaming around in search of something happening. The People Republic Of Cork needs no explanation. Langers or polluted mean inebriated. Thrun down is being very much the worse for being so inebriated. I will, ya, mean No I won’t as does I will in me hole. A bogger is anyone rural, i.e. from outside Dublin (or Cork). A hape of hang sandwedges is a lot ham sandwiches, reportedly the favourite food of Tipperary people, especially before and after Gaelic Athletic Association events, best served at the side of a road. The craic is ninety, but the ride is a pound. I’ve never been able to figure out how to accurately explain this or even when to use it. A bit nippy is very cold. A bit lumpy is very rough water. Aer a sign means any. Not the full shillin’ means mentally deficient. Hard to bate means very good. Doin’ a line mean a steady relationship. The aul enemy are English people. A Clatter is a wallop. Stall the ball means to wait a moment. A bit of a hames is a mess. Like is how Irish people end sentences. Now we’re suckin’ diesel is a positive affirmation. You can chalk that down. Make note of that. Flake down to the shop there. He flaked it from yerwan. To put, to go, yet also, to steal.